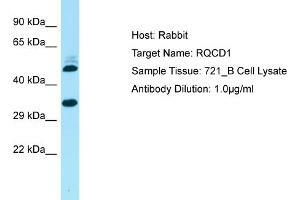 Characteristics This is a rabbit polyclonal antibody against RQCD1. It was validated on Western Blot. Background This gene encodes a member of the highly conserved RCD1 protein family. The encoded protein is a transcriptional cofactor and a core protein of the CCR4-NOT complex. It may be involved in signal transduction as well as retinoic acid-regulated cell differentiation and development. Alternatively spliced transcript variants have been described for this gene.